A series of strikes called ahead of Christmas show "contempt" for ordinary people and are "completely unacceptable", the government said. Prime Minister Theresa May called for all parties to sit around a table and settle their disputes. The comments come at the start of a week of industrial action. Some postal and rail workers are on strike and airlines also facing disruption. Weetabix workers have also voted to strike in the new year. A spokesperson for the prime minister said the strikes were wrong. Asked whether Mrs May believed the industrial action was being co-ordinated, the spokesperson said that was a matter for the unions, but they were displaying a "shared contempt" for ordinary people trying to go about their daily lives. Are we facing a Christmas of Discontent? Media captionDan Macadam of the BBC's business unit: "Four high-profile strikes have been called"
A strike at Crown post offices has closed about 50 High Street branches as the rail strike at Southern continues with conductors beginning two days of action. Talks aimed at averting a strike by British Airways cabin crew over Christmas will continue on Tuesday at the conciliation service Acas. The airline has pledged to run a full schedule even if the strike does goes ahead. Although striking over Christmas may seem to be unseasonal and positively Scrooge-like in its lack of respect for the festive season, to be fair there is little point in going on strike when no one will notice and the company will hardly be inconvenienced at all. Certainly some of the unions involved will believe just the threat of a strike over Christmas has enabled them to make progress. It is probably the disruption to Southern rail services that is the most painful for customers, and there is little sign of an end to the misery with further strikes planned in the New Year. But even so this is a long way from the Winter of Discontent in 1978-79. Then whole industries were hit and tens of millions of working days lost. In the first 10 months of the year 218,300 working days have been lost to industrial action. There are 300 Crown post offices across the UK - larger branches mostly situated in city centres. The Post Office says 250 branches have opened, but the union questions those figures and says even if a branch is open, there may be a reduced service. The Post Office has updated its website with details of branches affected by the strike. The Crown post office workers are protesting against pension changes, job security and closures. On Wednesday and Thursday, delivery drivers who supply many rural offices with cash will join the action. 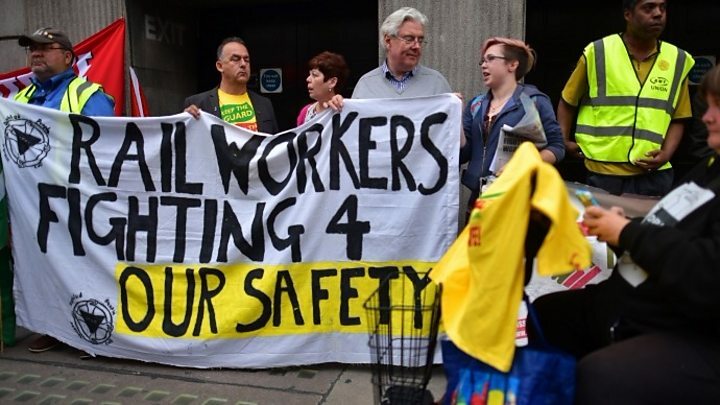 There are fears the situation could escalate if unofficial action is taken by Royal Mail workers - who are not currently involved in the dispute - and they refuse to cross picket lines. 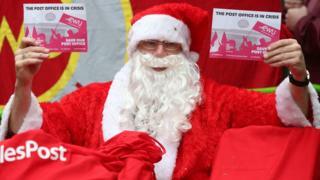 A Royal Mail spokesman said: "There will be little or no impact on Royal Mail as a result of the CWU strike at the Post Office. Deliveries will carry on as normal and the last posting dates for Christmas remain unchanged." Post Office communications officer Mark Davies said that the company was trying to become more efficient and reduce its losses, which would be good news for the taxpayer. "We have reduced losses from £120m four years ago, to £26m in the last year, and we hope to break even next year. We don't believe that taxpayers should pay out to support the Post Office, " he said. British Airways cabin crew belonging to the Unite union are due to strike on Christmas Day and Boxing Day in a row over pay. The airline said it had "detailed contingency plans" that will allow it to run a full schedule even if the cabin crew strike does go ahead. And Weetabix workers have voted overwhelmingly to strike in the new year in a row over new shift patterns. It will affect its factories at Corby and Kettering. Meanwhile, guards at Southern rail will strike on Monday and Tuesday in a dispute over the role of conductors. Along with a continuing ban on overtime by drivers in Aslef, the action will cause more misery for Southern's 300,000 passengers. RMT general secretary Mick Cash said: "Our conductor members on Southern are on strike this week in defence of the safety of the travelling public." In addition, Unite members employed by Swissport as baggage handlers and other ground staff at 18 airports across the UK are set to walk out on Friday and Saturday over pay, although talks will also be held at Acas on Tuesday. Members of the Transport Salaried Staffs Association and RMT on London Underground are continuing with an overtime ban in a dispute over jobs and ticket office closures, while pilots at Virgin Atlantic will start a "work to contract" action from Friday in a row over union recognition. When? Crown Post Office workers on Monday 19 December, Tuesday 20 December, and Saturday 24 December. Delivery drivers to rural Post Offices on Thursday 22 December and Friday 23 December. Professor Roger Seifert from the University of Wolverhampton said many of the tensions were longstanding and were "boiling over now because during Christmas they get more media coverage". He told the BBC Radio 4's Today programme that discontent among workers was not just affecting these companies, and that worsening pensions, stagnant pay and reduced job security was hitting a range of industries. The UK was entering "a period of quite bitter and prolonged disputes", Prof Seifert added. Media captionThe TUC's Frances O'Grady and Treasury select committee member Chris Philip clash over strikes. Frances O'Grady, TUC general secretary, pointed out that all the strikes were for different reasons and that the focus should be on the root causes. "We are working in a background where workers are still £20 a week worse off on average than before the financial crash, where we're seeing inflation rise and real pay cuts come in. We've had the rise of zero hours and sham self employment," she said. "Striking is always a last resort. We negotiate and settle thousands of deals." Ms O'Grady added that she feared there might be "another agenda" here to tighten union laws. 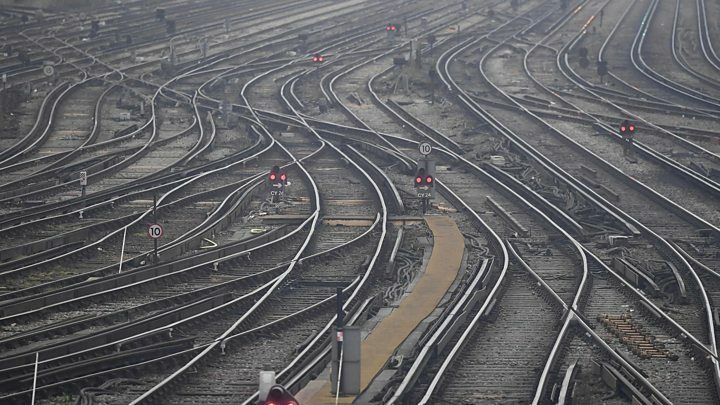 Conservative MP Chris Philp is calling for new laws that would mean in cases involving critical public infrastructure, such as the railways, a High Court judge would decide whether a strike is "reasonable and proportionate". He wants similar legislation to that in Spain, Italy and Canada, which means that when there is a strike, 50% of the service still runs.